The 1969 Stanley Cup Final was a best-of-seven series played from April 27 to May 4, 1969, between the defending champions Montreal Canadiens and the St. Louis Blues, the same finalists as in 1968. The Canadiens would win the series in four-straight games. The 1968 Stanley Cup Final was a best-of-seven series between the Montreal Canadiens and the St. Louis Blues. The Canadiens would sweep the series in four-straight games, in the first Stanley Cup series after the NHL expansion to 12 teams. Each game was decided by 1 goal. 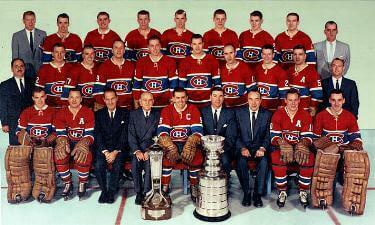 The 1966 Stanley Cup Final was contested by the Detroit Red Wings and the defending champion Montreal Canadiens. The Canadiens would win the best-of-seven series four games to two to win the Stanley Cup for the seventh time in eleven years. The 1965 Stanley Cup Finals was played between the Chicago Black Hawks and the Montreal Canadiens. The Canadiens won the best-of-seven series four games to three to win the Stanley Cup. The 1960 Stanley Cup Final was contested by the defending champion Montreal Canadiens, appearing in their tenth consecutive Final series and the Toronto Maple Leafs. This was a rematch of the 1959 Final. The Canadiens won the series four games to none for their fifth straight Cup victory.